...etc. etc. blah. blah. blah! Yep, healthy eating is pricey, yep it takes more effort than pressing a button on a microwave or ordering through your car door, but if you want to feel great, look great and truly be the best version of you, then quit the excuses and start looking to solutions! Here are some of my favourite 'kitchen hacks' that help save time, money and effort, whilst of course keeping things flavoursome and nutritious! 1. BUILD A Bargain hunter's FREEZER! Keep your eyes peeled for organic fruit that is on sale/reduced, buy it in bulk and freeze it. I do this with bananas, berries, melons, kiwis and all sorts. Doing this provides a cheaper way to organic smoothies, fruit ice creams and sorbets. Same rule applies to quality meat and fish produce. My freezer is like a treasure trove of yumminess! Be sure to chop larger fruits before freezing - take my word for it - peeling a frozen banana is tricky! 2. Think ag'in before you bin! There's something so sad about cut herbs wilting before they've had their time to shine, and often that window of opportunity is short! Whilst they add a health boost and super flavour to dishes, they don't come cheap, so wasting these bundles of goodness really makes me sad! So how can we prolong their promise of deliciousness? 1) Using a sharp knife chop the ends of the stems off. Place the freshly cut ends of the herbs into a glass of fresh water (keeping the leaves above water level). I also do this with celery stalks to keep them good and crunchy! 2) Freeze herb and oil cubes. Place herbs in the well of an ice cube tray, top up with olive oil and freeze. Simples. I find tougher herbs work best - rosemary, sage, thyme etc. For softer leaves such as coriander I blend the two to form a paste then pour into the trays. These are just SO handy for throwing in stir-fries, stews and casseroles, on top of roasted vegetables and more. You can also mix the herbs first and you've got you're very own bouquet garni! 1) Peel garlic the lazy way! Carefully push the side of a chopping knife over a garlic clove to squash it - the skin will then easily fall away. No more tedious cleaning of the holes in the garlic crusher or wasting the ends when you chop it. Chefs out there may be cussing me but I don't care - this way makes me happy! 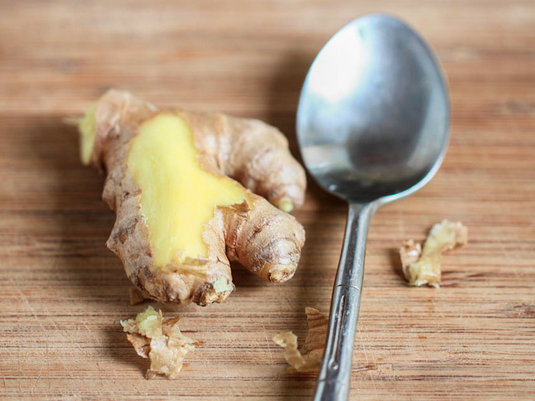 2) Use the edge of a teaspoon to scrape the skin off ginger root. So easy with minimal waste! Using the grater component to my food-processor revolutionised my life. Cauliflower rice, sweet potato hash, coleslaw, whatever veggies i'm throwing into soups. This makes things so quick and easy it's almost cheating! 6. NEVER WASTE THE WINE! I grew up in a household with one very strong rule - never let wine go to waste! If down-in-one isn't your thing and chances are you wont indulge again tomorrow, freeze the wine into ice cube trays or small pots to use later in cooking meals such as risottos, ragus, coq au vin etc. Such an easy way to add depth to recipes without having to crack into another bottle. It does however eliminate the excuse to indulge... i'm still trying to convince myself that that's a good thing! N.B: Always try and store foods in non-toxic containers: glass / pyrex / BPA-free etc. I save all glass jam jars to store various things in.